Transparency Market Research has published a new report titled, “Sharps Containers Market - Global Industry Analysis, Size, Share, Growth, Trends, and Forecast, 2017–2025”. 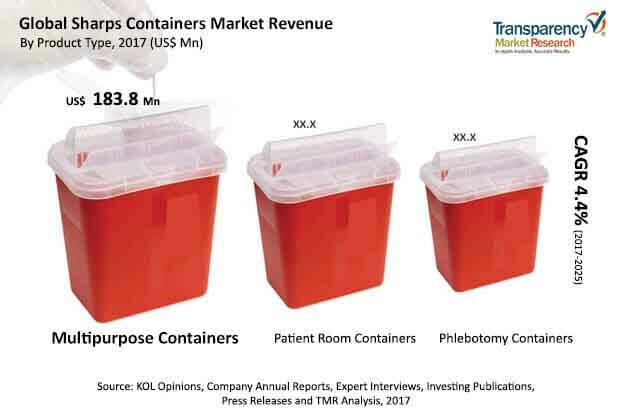 According to the report, the global sharps containers market was valued at US$ 450.0 Mn in 2016 and is projected to expand at a CAGR of 4.4% from 2017 to 2025. The report suggests that stringent government regulations for waste management is likely to spur demand for sharps containers in the next few years (2017 to 2025). Key players introduce technologically advanced sharps containers in developed markets such a North America and Europe. Hence, these regions are likely to account for significant share of the global sharps containers market. Rise in awareness about safe disposal of sharps waste, wide distribution network of major players, and market penetration of emerging players are likely to boost the growth of the sharps containers market in Asia Pacific. The market in the region is anticipated to expand at a CAGR of 5.8% from 2017 to 2025. According to WHO, over 16 billion injections are administered globally every year. Hence, it is crucial for health care facilities and other medical waste generators to collect and dispose the contaminated metal sharps waste correctly. The emerging sharps management services industry in developed countries is projected to fuel the growth of the sharps containers market in terms of revenue from 2017 to 2025. However, lack of awareness in the developing economies about the process to discard infected needles and syringes is anticipated to hamper the sharps containers market. According to India’s National Aids Control Organization, an estimated 86,000 new HIV infections were recorded in the country in 2015. Hence, poor awareness among health care workers and medical professionals about proper methods of sharps waste disposal is expected to restrain the sharps containers market by 2025. The report offers detailed segmentation of the global sharps containers market based on product, waste type, usage type, waste generators, distribution channel, and size. In terms of product, the multipurpose containers segment is poised to account for leading share of the global market during the forecast period from 2017 to 2025. However, the segment is anticipated to lose market share from 35.0% in 2016 to 34.3% by 2025. Rise in usage of insulin and steroid injectables which propels demand for patient room sharps containers for home use is a major factor likely to hamper the growth of the multipurpose containers segment. In terms of waste generators, the global sharps containers market has been segmented into hospitals, clinics & physician offices, long term care & urgent care centers, pharmacies, pharmaceutical companies, and others. The hospitals segment accounted for the largest market share in terms of revenue in 2016, and is anticipated to continue to dominate the market during the forecast period. Dominance of the segment is attributed to rise in number of invasive surgical procedures across the globe. Expansion in the pharmaceutical industry and increase in R&D activities are projected to propel the pharmaceutical companies segment during the forecast period. Based on usage type, the global sharps containers market has been bifurcated into reusable and disposable. The disposable segment held significant share of the global sharps containers market in 2016. However, the reusable containers segment is likely to expand at a high CAGR from 2017 to 2025. According to Greenhealth Magazine, over one third of the 2 million sharps containers used in hospitals in the U.S. are reusable. Increased investment by key manufacturers to improve the distribution network of reusable sharps containers systems and consumer shift toward reusable containers are the major factors likely to boost the growth of the reusable containers segment by 2025. Emphasis of local and regional players on diversifying the distribution network of sharps containers in niche countries is projected to drive the direct sale segment during the forecast period. The segment is expected to capture largest market share of 40.7% by 2025. It is likely to expand at a CAGR of 4.7% during the forecast period. Rise in adoption of e-commerce platform by small & medium quantity waste generators is anticipated to propel the online sale segment by 2025. In terms of waste type, the sharps waste segment is expected to account for a leading market share by 2025. Infectious & pathological waste is likely to be the second most prominent segment in terms of revenue during the forecast period. According to the American Diabetes Association, nearly 18.2 million people in the U.S. have diabetes; of these 5.6 million require daily insulin injections. High uptake of needles, syringes, and other sharps owing to rise in prevalence of chronic blood borne infections such as hepatitis and HIV is projected to boost the growth of the sharps waste segment during the forecast period. Miniaturization of sharps containers and significant popularity of pocket sharps containers are the major factors attributed to the dominance of sharps containers of 1–2 gallons in 2016. However, increase in number of health care facilities and other medium quantity waste generators across the globe are expected to boost the growth of sharps containers of 2–4 gallons during the forecast period. The segment is likely to expand at a CAGR of 4.9% from 2017 to 2025. In terms of revenue, North America was the leading market for sharps containers in 2016. Strategic presence of key manufacturers in the U.S. and emergence of the services sector in the U.S. for sharps management drive the sharps containers market in North America. Rise in health care spending in emerging markets such as China and India fuels the growth of the market in Asia Pacific. Geographical expansion of international players to this region through distribution and licensing agreements with local distributors and suppliers is anticipated to propel the market in the region. The market in Asia Pacific is likely expand at a CAGR of 5.8% from 2017 to 2025. Latin American markets such as Brazil is augmenting healthcare expenditure through rise in entry of international sharps containers manufacturers & healthcare providers in this region. This is one of the major factors projected to drive the market in Latin America from 2017 to 2025. The report provides profiles of leading players operating in the global sharps containers market. These include Sharps Compliance, Inc., Henry Schein, Inc., Bemis Manufacturing Company, Bondtech Corporation, EnviroTain, LLC, and MAUSER. Expansion of sharps containers portfolio through the acquisition of waste management business of emerging players is a key strategy adopted by the key players.